The Witness Protection Program claims it can keep anyone safe if only the person follows the rules...so Maria follows the rules. Every rule. She gives up everything--her friends, her family, her past, even her name--to ensure her daughter has a future. Reborn as Veronica Minor, Maria struggles to build a new life amid the beauty of her flower shop in the sleepy little town of Sunberry, Ohio. A life where her daughter can have a happy normal childhood. A life where her daughter will never know that her father was a monster. When a child disappears, Veronica prays it has nothing to do with her past, but what if she's wrong? 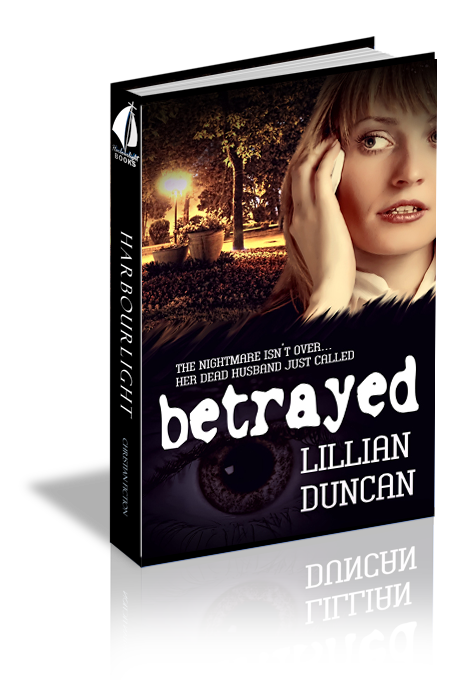 Not knowing whom to trust, she trusts no one...and that's her first mistake, because the nightmare isn't over--her dead husband just called from the grave. No way off. No way to escape. No way to get to her daughter. Why had she ever thought a yacht was a good idea for a benefit? Maria Hammond pushed her way through the throng of partygoers towards the exit. She had to get off this yacht and get to Layla before Raymond did. She jerked around at her husband’s voice, not believing her eyes. Raymond’s arm was snaked around Patti’s neck. Even from that distance, Maria recognized the panic in Patti’s eyes. Maria wanted to help, but there was nothing she could do. She had to get to her daughter. It was her only chance to keep Layla safe, to keep her away from her father. Otherwise, she would never see her child again. Maria kept moving towards the exit ramp of the yacht. Who was this stranger she’d slept with for so many years? She’d believed he loved her when they married, but she’d been so wrong. The events of the past month proved that—and more. “Don’t do it, Maria.” Raymond’s voice was low and guttural, in spite of the noise from the crowd surrounding them. She turned back as he moved the gun to Patti’s head. His eyes turned black with rage. The face of evil. Why hadn’t Maria seen it before? How could she have married a monster and not even known? Her heart broken, she turned and pushed through the crowd. No one noticed the drama happening in their midst. Maybe, they needed to notice. When Maria hazarded a glance back, Raymond trailed with one arm around Patti’s neck. The other hand still held a gun, now pressed against Patti’s temple. Maria pointed. “Gun. He’s got a gun!” Maria screamed, and then pointed at Raymond. A buzz travelled through the growing crowd. Maria kept yelling. She couldn’t do much, but she could draw attention to Raymond. Murmuring grew louder—more partygoers panicked. People shoved and pushed as they tried to get away from the madman with the gun—her husband. Others stared and pointed. Hatred glittered in Raymond’s eyes. It was time to go. She’d managed to turn attention to Patti and Raymond. Surely, someone would intervene. Someone would help Patti. Then a burning stab of pain. Her back. She turned. Raymond’s gaze met hers. He smiled. Another hot burst of pain. This time in her stomach. Have to get to Layla. Her feet wouldn’t move. She swayed, and then crumpled to the deck. Her hand moved to her stomach. Wetness. Red wetness. She gasped for air. It didn’t matter how much it hurt. She had to get to her daughter. She attempted to stand, but collapsed onto the smooth wooden deck. Her cheek rested against the wood, now dirty from all the feet that had walked on it that day. Summoning strength, she moved to hands and knees, crawling. Nothing would stop her from getting to her daughter. The world suddenly turned wavy and she fought to stay conscious. Raymond thought he had all the power, but he’d forgotten one thing. A mother’s love knew no limits.